Personally, the one that stands out to me is being named 2009 Cape Cod League Top Prospect. The Cape is stacked with MLB talent year in and year out and for Cunningham to stand out, even on a team with Hunter Morris and Brian Fletcher is just scratching the surface on his talent. Has been a tremendous player during his first two years…a very steady player that has been asset to the program...he is a guy that wants to be the very best at whatever he does and works that way on a daily basis, and it pays off…an outstanding defensive player, accurate throwing arm and a switch hitter…can steal bases and plays hard everyday…gets a good jump on the ball and is a very accurate thrower…had an outstanding summer playing in the Cape Cod League last year. On a night when it seemed to be raining hardware in Falmouth, Todd Cunningham (Jacksonville State) was also distinguished as the Pro-Prospect of the Year. The scouts, using the simple criteria of who will make the biggest major league impact in their career, vote on the Robert A. McNeece Pro Prospect of the Year Award. Cunningham joins a group of recognizable names from Cape League History and Major League Baseball. Matt Wieters (Georgia Tech) won the award with Orleans back in 2006 and is now in the discussion for American League Rookie of the Year with the Baltimore Orioles. Mark Teixeira(Georgia Tech) of Orleans and Billy Wagner (Ferrum) of Brewster are both former winners of this prestigious award. The young man they call “Cape Todd” got this award because he receives at least a four rating in four of the five categories in a scout’s book. (Scouts tend to rate the ‘five tools’ which are running, fielding, throwing, hitting and power hitting on a scale from one to five. This means that an excellent player in each area is a ‘five-tool player’ or a ’55.’) Cunningham’s power ability is a point of concern for some scouts, but others feel he may acquire the ability to hit for power. Either way, his other four tools are all in the plus column. We continue the list today with number 44 in our countdown with Jacksonville State junior outfielder Todd Cunningham. He is from Jacksonville (AL) High School where he played five years of high school baseball under David Deerman, Michael Graben and Rusty Burroughs. He finished his high school career with a .446 batting average with 216 runs scored and 112 stolen bases for the Golden Eagles. In his senior season, he hit .430 with 66 runs scored and an on-base percentage of .593. He picked up several honors in high school as he was named a three-time first-team All-State selection (2005, 2006, 2007) and named second-team All-State in 2004 by the Alabama Sports Writers Association. He made an immediate impact on the Jacksonville State lineup as he appeared in 57out of the teams 58 games. He finished the season with a .340, after recording 73 hits, with 16 doubles, three triples, one home runs and 30 RBI. He was named the Ohio Valley Conference Freshman of the Year while being named 2008 Louisville Slugger Freshman All-American. 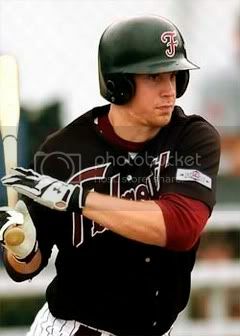 He spent the summer of 2008 in the Texas Collegiate League where he played for the Brazos Valley Bombers. He finished the summer with a .310 average with 17 RBI while stealing 13 bases in 15 attempts. He was named to the 2008 All-League team. Cunningham continued his strong collegiate career during the 2009 season as he hit .339 with 10 homers and 47 RBI as he appeared in all 57 games for the Gamecocks. He also was solid on the base paths as he stole nine bases in eleven attempts. He spent the summer of 2009 in the Cape Cod Baseball League with the Falmouth Commodores. He finished the summer with a .378 batting average and an on-base percentage of .458 which were both the best in the League. He also showed some power by hitting three homers and driving in 22 runs. He continued to be solid on the bases as he stole 11 bases in 14 attempts. He was named to the CCBL All-Star game and was selected for the CCBL All-League team. Baseball America rated him the ninth best player in the League. "If they were there, it's news to me," Cunningham laughed. "The did a good job of hiding, I'll tell you that. But I don't consider myself toolsy at all. I have to work at it. I'm not able to go out there without practicing and just drop bombs, run a 6.2 60 [yard dash] or throw 95 from the outfield. I'm just not good enough to do that. But the ability to put it all together and work through struggles, to put together good at-bats or move runners over, that's my strength." "Look, I'm not even really thinking about the draft. Considering it career possibility isn't something I planned. It just sort of happened after I had the good showing in the Cape. I owe a lot of my success to other people I've worked with....It's about surrounding yourself with good players and good people." So there you go. One of the best players in the nation will be in Auburn on Friday. Check him out before he starts turning heads in the Pros.